Today, we use ion thrusters to correct satellite orbits and visit asteroids. In 100 years, we might be using them to propel massive generation ships that send colonists to a different part of the galaxy. Your typical space craft is propelled by chemical rockets. It is basically riding a continuous explosion to get from point A to point B. Chemical rockets are great for providing high acceleration, such as the kind of acceleration you need to escape a planet's gravity. They're not so great in terms of efficiency – it takes a lot of fuel to generate the powerful thrust of a chemical rocket. This makes them less than ideal for long-term missions, or applications that require fine adjustments, such as counteracting the weight of sunlight. That's where ion thrusters come in. The idea for such a thruster has been around since the early 20th century, and we've had working models at least since the 60s, but the technology has really come into widepsread use in the last ten years or so. Ion thrusters are actually very weak in terms of the amount of force one can produce at any given moment. You could probably out-thrust an ion thruster with a good hard shove. What makes ion thrusters truly shine is their specific impulse. Specific impulse is like the miles per gallon rating for a rocket or a jet (or an ion thruster). A high specific impulse means an engine can generate a lot of thrust for a small amount of fuel, and ion thrusters tend to have a really high specific impulse. You could run one continuously on a modest tank of xenon gas for years. All ion thrusters work via the same mechanism, though they get there in different ways. Atoms of a neutral gas are ionized (given a positive charge), then propelled out the back of the thruster using either electromagnetic or electrostatic force. The mass of the ions imparts that whole "equal and opposite reaction" thing and pushes the ship in the opposite direction. That's part of the reason why xenon is often used – it has a pretty high atomic mass (it's also inert and ionizes easily, but is kind of rare and quite expensive). Many ion thrusters used by western nations use electrostatic grids. Accelerated electrons ionize xenon atoms by crashing into them, knocking off an electron or two and turning the atoms into positive xenon ions. At the back of the thruster is a grid with a negative charge. The positive ions are drawn to this grid, but because it has many spaces in it, most of the ions just fly out the back and create thrust. An electron stream is added to the exiting ions to keep the ship from gaining a negative charge, and to prevent the ions from being drawn back to the thruster, negating the thrust. The Soviets used a different style of ion thruster as far back as the 1970s, a design coming into vogue again for current space missions. Hall Effect thrusters (pictured) hold electrons in place with a magnetic field, creating an area of negative charge. An anode draws electrons down toward the xenon atoms, ionizing the xenon. The ions are then drawn toward the magnetic field's negative charge. The field holds electrons in place, but the heavier xenon ions fly right past, out the back of the thruster. Other ion thrusters use electromagnetic force to propel the ions, but the basic concepts are the same. Another variety creates a magnetic plasma field and exploits a difference in charge to shoot ionized gas out of a nozzle. Also of note are FEEP (Field Emission Electric Propulsion) thrusters, which shoot ionized droplets of liquid metal. They'll be used on the LISA Pathfinder mission to keep the craft stable in response to the minuscule force of sunlight pushing it ever so slightly away from its required position. So, why are ion thrusters awesome in science-fiction? They make space travel cheaper, for one thing. If you're flying to the outer solar system or father, the chemical propellant needed for the trip would weigh a lot. Lifting all that fuel off of a planet's surface makes such missions prohibitively expensive. If you use ion thrusters for the long-distance part of the journey, all you need to carry is the chemical fuel that gets you in orbit and then a few tanks of xenon. The weight and money savings is huge. Over the long haul, ion thrusters are capable of producing much higher speeds than chemical rockets. Because of their high specific impulse, they continue to produce thrust for long periods, years or even decades. Since there's no friction in the vacuum of space, the thrust continually adds velocity. This kind of thrust is ideal for worldships or generation ships, massive vessels carrying entire communities that will live out their entire lives on board, creating new generations of travelers. If you can get the ship's speed up to .2 light speed (which becomes more of a structural issue than a thrust issue), you can reach a bunch of nearby stars within one or two generations. 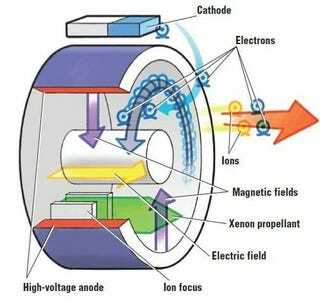 Basically, if you're writing hard SF and you don't want to wave your hands and create some kind of magical faster-than-light travel technology, ion thrusters make space travel practical and can produce some of the fastest sub-light speeds theoretically possible. Just be sure to keep some chemical rockets around to use as brakes.